Gunnar began to study the shakuhachi after having arrived in Japan in 1985. He was after a short period of time introduced to the master Yamaguchi Gorō (1933–99), the youngest ever designated living national treasure. Yamaguchi-sensei was head of the still active Chikumeisha guild of Kinko-ryū Shakuhachi, the oldest of the existing lineages of shakuhachi. In 1993 Gunnar received the Japanese Monbukagakushō Scholarship, to study shakuhachi as soloist, at the traditional music conservatoire at Tokyo National University of the Arts (Tokyo Geidai). After two years of studies, Gunnar passed the entrance exam to the Master's program, and finished with an MA degree as shakuhachi soloist in 1997, the second non-Japanese to do so. Gunnar received his traditional license, shihan, and the name Jinmei (儘盟) from Yamaguchi Gorō in the summer of 1998, immediately after the first International Shakuhachi Festival to be held outside of Japan, in Boulder CO, USA. Very sadly, Yamaguchi Gorō passed away only months after that. 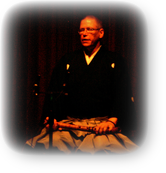 From 1997 to 2005 Gunnar was professionally active as performer and teacher of shakuhachi in Japan, but also teaching and performing in Europe and the US. In 2005, after some 20 years of activities in Japan, Gunnar moved to Europe. He is now actively performing and teaching both privately and through regular workshops in Stockholm, Helsinki, and Paris, as well as other shakuhachi events. He is working as Associate Professor at the Department of Asian Studies, Stockholm University, conducting research in the traditional (or pre- to early modern) genres of Japanese music. Presently he is studying the structure of some Edo-period music genres, as well as the song texts of the chamber music of the 18th and 19th centuries Japan (so-called jiuta-sōkyoku or sankyoku). Gunnar is also occasionally teaching shakuhachi at the Royal College of Music in Stockholm (KMH)). In 2016 Gunnar was awarded the Japanese Foreign Minister’s Commendation for outstanding achievements in international fields, and for the promotion of Japanese culture, teaching Japanese language, culture, and history, as well as a wide array of outreach activities, and the teaching and performing of shakuhachi in Europe. 1993 Entered Tokyo University of the Arts. 1995 Performing "Shizue" (comp. J. Swensen) with the Swedish Radio Symphony Orchestra (World Premiere). 1996 Performing "Shizue" with Lahti City Symphony Orchestra. 1997 Graduated with an MA in shakuhachi as performing art. Performing "Shizue" with the Royal Scottish Chamber Orchestra. 1998 Received his shihan Master License, and the name Jinmei. Executive committee of the World Shakuhachi Festival at Boulder. Recording and performance at the Swedish Radio. 1999 Released an English language instruction video of Kinko-ryū shakuhachi honkyoku. 2002 Recorded his third album “WA – Kinko Kokin”. 2003 Second European Tour, including performances at London City University and Stockholm University. Recorded the honkyoku album “Taki-otoshi”. 2004 Invited to the Bisei International Shakuhachi Festival. 2006 Invited performer to the first European (ESS) Shakuhachi Summer School in London. Unable to attend for medical reasons. 2007 Invited performer to the second ESS Shakuhachi Summer School in France. Unable to attend for private reasons. 2008 Invited performer to the World Shakuhachi Festival in Sydney. 2009 Invited performer to the ESS Shakuhachi Summer School in Leiden, Holland. 2010 Invited performer to the ESS Shakuhachi Summer School in Prague. Invited performer to the Prague Shakuhachi Festival. Associate Professor in Japanese Studies at Stockholm University. Associate Professor in Shakuhachi at the Royal College of Music. 2013 Invited performer to the ESS Shakuhachi Summer School in Barcelona. 2014 Invited performer to the ESS Shakuhachi Summer School in Radolfzell. Performing Joseph Swensen's "Shizue" with Oporto Symphony Orchestra. Recording.. Interview with the composer Joseph Swensen. 2015 Invited performer to the ESS Shakuhachi Summer School in Paris. 2016 Invited performer to the International Shakuhachi Festival in Prague. Invited performer to the ESS Shakuhachi Summer School in Barcelona. Japanese Foreign Minister’s Commendation for outstanding achievements in international fields. 2017 Performing Joseph Swensen's "Shizue" with the NFM Leopoldinum Orchestra, Wroclaw, Poland. Invited performer to the ESS Shakuhachi Summer School in Vejle, Denmark. Invited performer to the International Shakuhachi Festival in Prague.